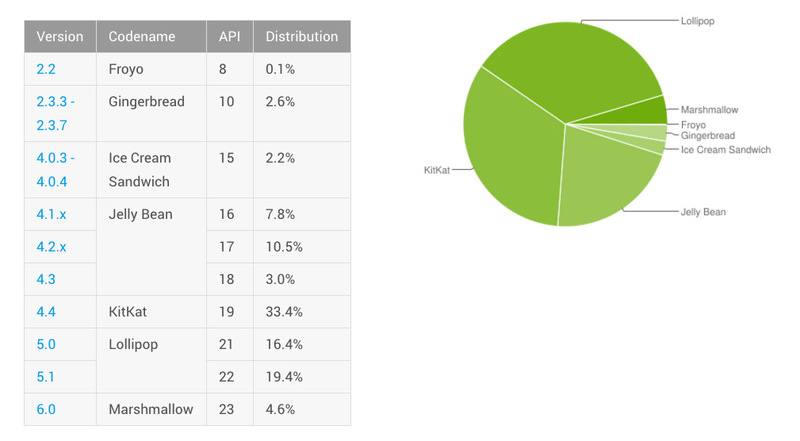 The new Android distribution numbers are in for April 2016, with Marshmallow showing slow, but steady signs of growth. From last month to this month, Android 6.0 has jumped 2.3% to 4.6%. I know, I know, it’s been months since Marshmallow was released and this looks really bad, but it feels like we’re getting somewhere, especially now that Samsung has started updating many of its phones to Android 6.0.1. As for the rest of the numbers, everyone else dropped, like Lollipop to 35.8% from 36.1%, KitKat to 33.4% from 34.3%, Jelly Bean to 21.3% from 22.3%, and ICS to 2.2% from 2.3%.